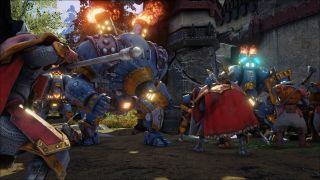 A couple of years ago we pointed your attention towards the Kickstarter for Warmachine: Tactics, a game of "steam-powered robots and elite warriors in raging battles dominated by magic and mechanika." Developer Privateer Press Interactive asked for $550,000 to convert the Warmachine tabletop game into a turn-based tactical PC game, and ended up with nearly triple that amount. We haven't said much (anything, really) about it since then, but if you're curious how it's all worked out, a free demo is now kicking around on Steam. The demo offers three of the 20 levels available in the single-player game, as well as the skirmish mode and access to multiplayer matches, including against owners of the full game, but with limited squad-building options. Customizable loadouts for four of the game's six main factions are included, each with a unique visual and play style. For those who already own Warmachine: Tactics and are digging it appropriately, the Retribution of Scyrah DLC was also released today. The expansion adds an entirely new faction to the game that includes eight new units: Dawnlord Vyros, Hydra, Manticore, Gorgon, Dawnguard Invictor, Dawnguard Sentinel, House Shyeel Battle Mage, and Mage Hunter Infiltrator. A bug-fix update to the game was released alongside the new DLC, but the announcement acknowledges that a rather large number of "known issues" remain unresolved.